Last night I carried some girls from the Casino to King Street Wharf (fair dinkum, if the RTA/City Council doesn't do something about access from the Wharf, in future I'm going to refuse to enter the gridlocked precinct on Saturday nights) who complained about their in-vehicle SatNav devices giving false readings in the City. Speaking of dodgy SatNav instructions, can any Sydney readers identify localities where their navigation aid suggests a turn/path which is clearly illogical ? 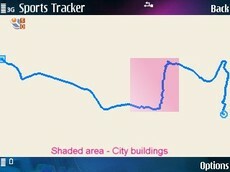 Mapping automatically plotted by importing GPS co-ords from a Nokia N95 running SportsTracker (nerd alert!). Map images enlarge.